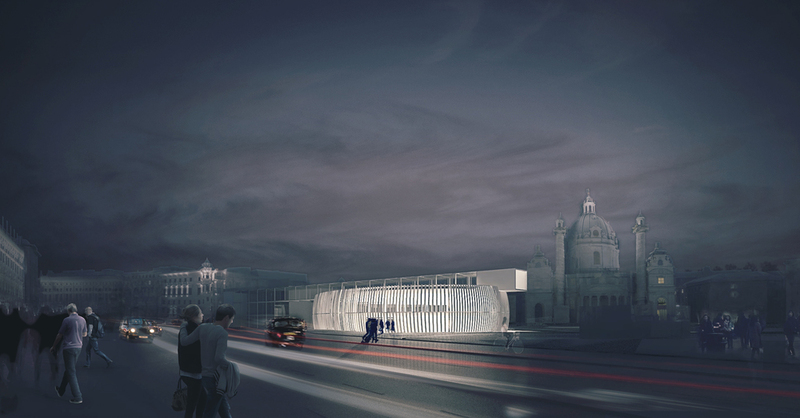 Submission for the Wien Museum Neu Competition. With Ryan Ball and Kyle WInston for DPMT 7. Karlsplatz today represents an inherent shift in the framework of the city; a meeting of spatial, institutional, and social ideals. This proposal draws upon the landscaped ellipses in Karlsplatz and their ambiguous relationship to the adjacent buildings. Our goal is to subvert this opposing relationship to create a legible interaction of landscape and built environment, people and institution, and engagement of the past, present, and future. A sunken plaza seeks to establish the museum’s presence on the square, creating a programmable extension of the museum into the public sphere. The elevated pedestrian bridge allows for movement between the Haerdtl building and proposed addition. Embedded in the addition, the bridge registers as a slice through the building volume and provides vertical circulation and access to the temporary exhibitions as well as art display. Patrons ascend through this slice to a framed view of Karlsplatz before turning to continue toward the Haerdtl building and permanent collections. Algorithmically oriented louvers on the addition respond to varying solar exposure on the building’s rounded façade, offering even, diffused light to the gallery and exhibition spaces.